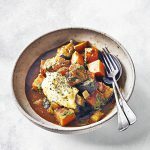 The addition of sweet potato and dates adds a deliciously sweet flavour to the complex blend of spices and veggies in this warming vegan tagine recipe. Heat 1 tbsp of the oil in a non-stick frying pan and gently fry the aubergines for 5 minutes, stirring frequently until starting to brown. Reserve 1 tbsp of the onions and add the remaining onions and oil to the pan. Fry for a further 5 minutes. Put the bouillon powder in a large jug and add 700ml boiling water. Pour all but 100ml into the pan and add the sweet potatoes, dates and ras el hanout. Cover and cook gently for 20-25 minutes until the potatoes are very tender, stirring frequently. Blend the chick peas in a food processor with the reserved stock and onion until smooth. Season to taste and spoon into a serving dish. Stir the coriander and vinegar into the tagine, and cook for a further 2 minutes. Serve in bowls topped with the chick pea purée.